Whether on the lake for a relaxing paddle day with the kiddos or a solo trip down the river through a class V and surf on the eddy, we give these inflatable kayaks a high-five. At First, we rode them backwards with no tracking. Class III on the Nolichucky River. After we had our daughter, we wondered how we would continue to hike and bike on trails that you don't see many kids, or people for that matter. After living in a van over the summer, the Burley Solo answered all our big mountain prayers. It's a necessity for outdoor parents who want to stay active. And Biking the Creeper Trail. You know those favorite Patagonia fleeces that you wish you could wear out in the rain on a chill autumn day? Well, now you can. Just throw them in the wash and grab an ice cream scoop full of TW. This stuff rocks, along with the Tent Solarproof to provide UV protection and waterproof your beloved home on stakes. Our experience with and How-To Nixwax. From paddling Colter Bay to cruising down Icicle River, these jackets are comfortable and practical for the whole family and the solo water-shark! That time we saw moose and paddled Colter Bay. The Cherry Apple Chia and the Mango Apple Chia are delicious with no added sugars. All Natural, as simple as it gets. The Pineapple Banana Kale however was a bit too raunchy for us. We like Kale in dried form, but it was tricky to swallow. Love the granola bars of course! From work to school to the mountains, this pair of pants has lasted me a year of comfort and durability. No changing from one pair to another, I wear these straight from the routine to the trail. They are like the khaki version of leggings. Here is a video from Buffalo Mountain in my MKs. After a full day of hiking or trail running, these sandals are the bomb for helping your arches and calves recover. I wear them all day after a big hike and between yoga sessions. They may look funky at first sight but your feet will thank you and prep you for your next big workout outside! Our daughter has been practicing balance on this bike before she can even walk. It helps her build confidence and stand! She calls it her "bi" and gets excited when we pack it in the van for a day outside. 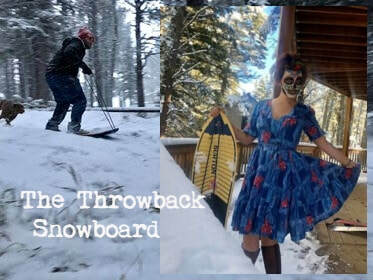 Product: The Throwback Snowboard "Snurf"